There may be a time when you need to access the root report file for a custom or standard report within Acctivate. The most common reason you may need to find this file is if you need customization work or editing done to the report template itself. Outlined in this article is the standard path to locate any given report in your Acctivate system. The location of the report file depends on whether the report in question is custom or not. To find this out, open up the configuration manager within Acctivate, expand the “Reports” folder, and click on the “Reports Catalog”. Next, expand the folders until you find the report title you’re looking for. In this example, we’ll first look at the Invoice Report. 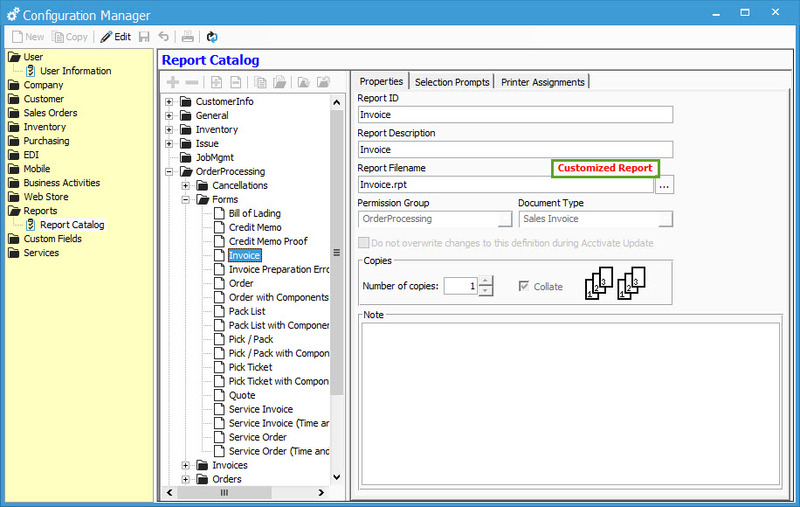 As you will notice, this report has the “Customized Report” label above the filename field. This indicates that this report is custom and can be found in the custom reports folder. Note down the text in the filename field, and then close the configuration manager. 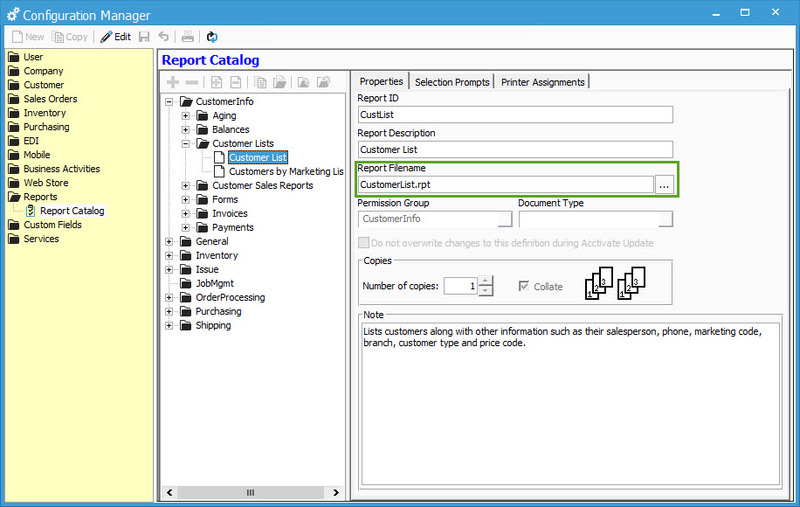 The fastest way to get to the custom report folder is to take the following steps. 1. 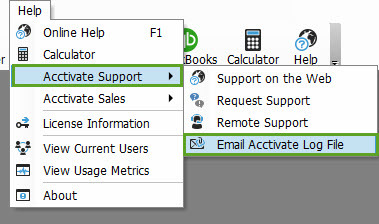 Click on the “Help” menu option at the top of the window, highlight the Acctivate Support option, then click on “Email Acctivate log file”. 2. This will bring up the the log window. From here, click “Open Folder” and proceed to the next step. 3. You’ll be brought to the log folder, which is just a few clicks away from our destination. Click the “AcctivateData” folder name in the address bar at the top of this window. 5. Once there, scroll through to find the report in question. If you’re sending it off for customization, make a copy of the file and then email it to your consultant or support rep. If after locating the report in configuration manager, the report in question doesn’t have the “Customized Report” tag on it, then you’ll need to go to the standard report folder. 1. 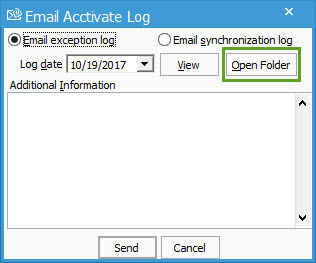 First, take steps 1-2 from the above section to open the log folder. 2. Once there, click the server name between the network name and the “AcctivateData” folder from the top address bar. This is the standard position for the server name (as indicated by the green highlight box in the following image). 6. Once there, scroll through to find the report in question. If you’re sending it off for customization, make a copy of the file and then email it to your consultant or support rep.